Always on the lookout for new ideas, in 1983 Honda presented the XLV 750, a curious motorcycle that clumsily copied the eyeball-searing color schemes of contemporary motocross machines. Though it was in fact an excellent touring motorcycle, the XLV 750 was too heavy to be an off-road bike and the prospective clientele could not imagine the purpose for which it had been designed. 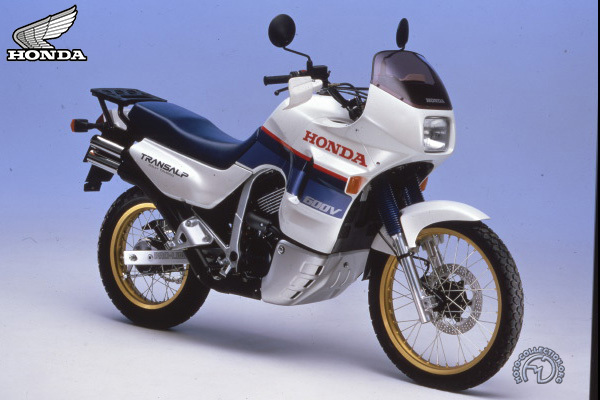 Though the XLV had been far off target, Honda was not discouraged, and returned with the 1987 TransAlp. This time the product was much more highly developed, and intended specifically for Europe. But to position its motorcycle precisely in the marketplace, Honda created a new category especially for it: "Rally-Touring." To make doubly sure, Honda even sponsored an annual rally reserved for TransAlp owners. The stratagem was successful and the TransAlp became a huge commercial success. Faster and a better road bike than the single-cylinder trail bikes, the TransAlp cost little more than its rivals. Without pretending to be a sports machine, it could handle rough going in style. Its enveloping plastic shield made it a machine that stayed clean and was easy to maintain. While its kinship with the dominant off-roaders – including the NXR Honda which had four times won the Paris-Dakar, made it a supreme image-building bike. Which explains its long success. The Transalp is a supreme off-roader capable of going to the ends of the earth.